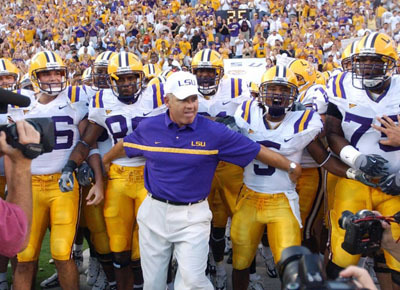 The disruption of LSU's 2005 season didn't end with Katrina. 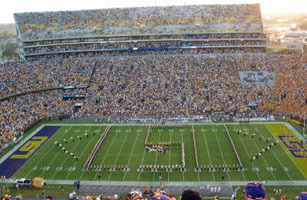 After a prescheduled bye week September 17, the Tigers prepared to host Tennessee on Saturday, September 24. Tiger fans always look forward to the SEC home opener. 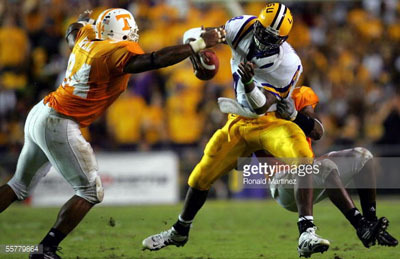 But after the tragedy of Katrina, they couldn't wait to gather on a "Loo-siana Saturday Night" in Tiger Stadium to enjoy some semblance of a return to normalcy and welcome their #3-ranked team after its great win in Arizona. What special pregame and halftime ceremonies was LSU planning to honor those who lost everything in the storm and the many thousands who assisted the victims of the tragedy? Coach Miles added an element to LSU's football tradition. 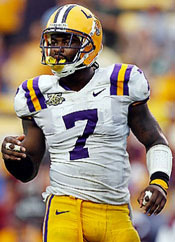 If the Tigers won, he would lead his players to the student section and sing the alma mater with the LSU band. A reporter asked him if he knew the words. I'm still struggling. But I'll know it really well by Saturday night. The number of people living in the metropolitan area of the state capital was estimated to be double the pre-Katrina population. So how many season-ticket holders would be unable to secure hotel space anywhere close to Baton Rouge? More importantly, would the visiting team and fans be able to find accommodations for the game? 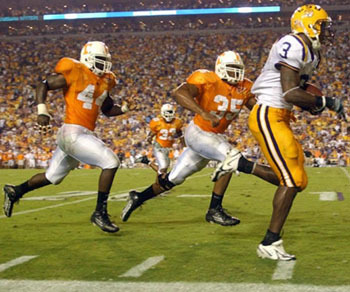 Tennessee officials asked LSU if the game could be played in the afternoon. 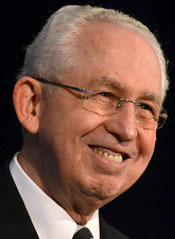 LSU officials refused to change the game time, and SEC Commissioner Mike Slive declined to intervene. So coach Phil Fulmer decided to travel to Baton Rouge the morning of the game, arriving about noon and returning after the game, scheduled for 6:45 PM. The hotel has made available to us some rooms for our players to get off their feet, some dining area or banquet area for us to have our meeetings and pregame ... If we had done anything differently, it would have displaced some people there that are working with the folks in New Orleans ... to help them get their power back up and everything, and we just didn't think that was the right thing to do. ... Considering the circumstances we're dealing with, with the people that have unfortunately been through that tragedy of Katrina, I'm comfortable with wher we are and what we have to do to help that situation anyway we can. ESPN decided to bring its popular "College Game Day" program to LSU. The network, which would also televise the clash, chartered a riverboat cruise ship for its cast and crew. Unbelievably, weather forecasters began following another tropical storm the weekend before the Tennessee game. Hurricane Rita came into the Gulf of Mexico between Florida and Haiti on the 21st. Surely, Mother Nature wouldn't send another storm into ravaged south Louisiana, would she? As the week went on, the storm kept chugging west. When it started to turn northwest on Wednesday, it became a serious threat to the Saturday night game. The Tigers and Vols had to prepare as if the game would be played at the scheduled time. 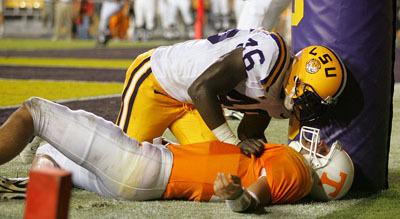 Les Miles expected a more physical game from Tennessee than from Arizona State. OT Andrew Whitworth, who would be starting his 41st straight game, agreed. 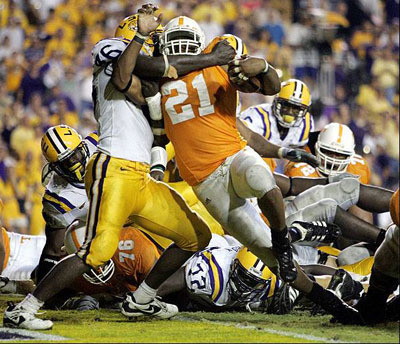 Anytime you play Tennessee, you're going to get that. ... They play with big linemen on both sides of the ball, so I think that up front is going to be the real key this weekend. It's going to be a real physical football game on all aspects of the game. We're going to have to be ready for that challenge, and we're going to have to prepare for it. Miles also expected the Volunteers to run the ball more than the Sun Devils did. DT Kyle Williams: If you can take the run game away from the Vols, you get them to where you make them do things that they don't want to do. They definitely want to run the ball first to set up the pass. The LSU defense had nowhere to go but up since they were ranked dead last in NCAA Division I-A in total defense and passing yards allowed (461 in the one game against Arizona State). Was the Tiger D that bad or the Sun Devils that good? Definitely the latter since ASU ranked #1 in the nation in offense after hanging 773y on Northwestern. D-coordinator Bo Pelini hoped to improve the pass rush but wouldn't reveal whether his plan included more blitzing. 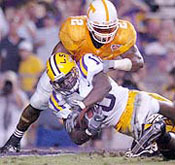 The Vols came off a nationally televised 16-7 loss at Florida that stripped UT of its #5 ranking. 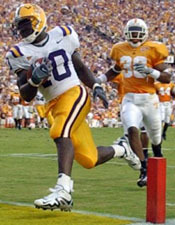 The defeat eliminated the possibility of the first battle of undefeated top five teams in Tiger Stadium since the 1959 LSU-Ole Miss ("Cannon's run") game. Which QB would play for the Vols? 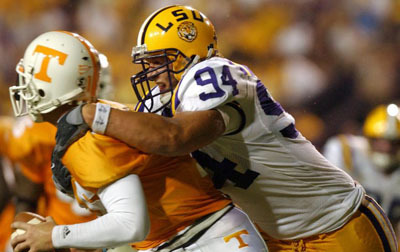 Erik Ainge or Rick Clausen, who transferred from LSU two years earlier.? The two rotated in the first two games. Fulmer eliminated the speculation by announcing on Monday that Ainge would get the nod. Erik had the stronger arm and was more mobile. He also admitted that using two men under C may not have been a good idea. Hindsight is 20-20, and I was trying to be fair to all concerned. Rick had played really well for us. It's not working out. On Thursday, with Rita continuing to move toward Louisiana, Commissioner Slive postponed the LSU-UT game until 6:30 PM Monday. That made LSU 0-for-3 on playing its first three home games as scheduled. Associate commissioner Charles Bloom explained: Looking at the information we had, Saturday is not going to be a good weather day all the way around. Sunday, it looked like, things would get better at night, but travel in the morning and afternoon could still be hazardous. Monday became the safest date for travel. Associate AD Herb Vincent explained: The commissioner made a very difficult decision after LSU, Tennessee, and the SEC office put all the issues on the table and analyzed the facts. Herb also said, Playing somewhere else was off the table very early. Skip made that clear, and the SEC respected that. So did Tennessee. Fulmer indicated he pushed for the change. We've bent over backward to do everything we can to make this happen, including gong down the day of the game. Obviously, if they're sending people out of Louisiana, I don't know why we would be going in. My president will not allow that to happen. AD Skip Bertman resigned himself to the ruling. We will now face significant logistical challenges, but we hope for the continued cooperation of our fans. Naturally, our strong preference would have been to play during the weekend, but safety for student-athletes, fans, and everyone else involved in a football game was the overriding factor for the commissioner. The game would switch to ESPN2 because of Monday Night NFL on ESPN. 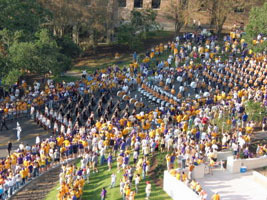 Research showed that the game would be the first ever on the LSU campus on a school day. 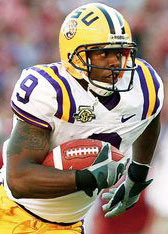 Attendance was already uncertain because of lack of hotel space in the Capital City, but Vincent expected a good crowd even though 12,000 season ticket holders lived in the area affected by Katrina. On the other side, how many Volunteer fans who had planned to come to Baton Rouge for the weekend but be able to attend a Monday night affair? Miles: This is another turn in the road for this football team. It's something that we have gotten used to over the past month. I think we'll respond very well. But Les admitted at halftime of ESPN's Thursday night game that Our guys initially were a little down. They would like to have opened the season at home in our stadium on Saturday night, but I think they're looking forward to Monday night football. We have a mature football team. An attendance announced as 91,986 (with about 6,000 no-shows) at the first Monday night game in Tiger Stadium history gloried in the familiarity of the pregame rituals. A moment of silence was held for the victims of the hurricanes, and the Tiger band played "Walking in New Orleans" before the alma mater and national anthem. As someone who was in the stands, I can say that the atmosphere was as electric as any I had experienced in Tiger Stadium - and that's saying a lot. The team was higher than a kite and it showed in the way they started the game. Steve Korte tackles Inquoris Johnson on opening kickoff. Ken Hollis celebrates his fumble recovery with Chevis Jackson. 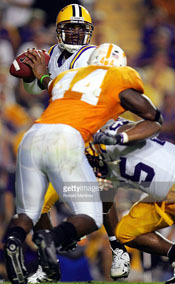 LB Omar Gaither rushes JaMarcus Russell. Shyrone Carey lugs the leather. Kevin Simon wraps upAddai in Q2. Jesse Daniels menaces Rick Clausen. 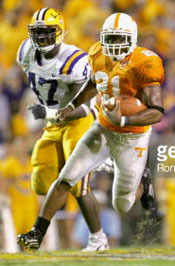 Tremaine Johnson chases Gerald Riggs. LSU won the toss and deferred. 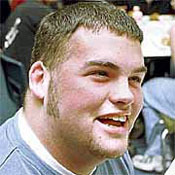 Q1: The fired-up kickoff coverage team swarmed Inquoris Johnson at the 12. The defense was so excited they committed two penalties on the first three plays - incidental face mask and offside to give the Vols a first down. On second and 6, Ainge rolled left out of the shotgun and was stripped from behind by blitzing S Jesse Daniels. LB Ken Hollis jumped on the loose ball at the 19. Hollis: Coach called a blitz, and I was just running to the QB, and the ball was there, and I just jumped on it and tried to make a play. 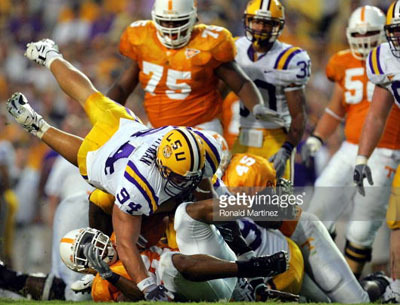 Jesse Daniels causes Erik Ainge to fumble. Using a blitz package they hadn't shown in the opening game, the Tiger defense confounded the Vols throughout the first half. The visitors punted on their next five possessions, none of which lasted more than four plays. But LSU wasn't doing much better. After going three-and-out on their second possession, they drove to the 28y to the UT 35 thanks to an 18y pass from JaMarcus Russell to WR Dwayne Bowe and a 15-yarder to Craig Davis. But Russell fumbled the ball away on the next play. After an exchange of punts, LSU forced another kick as the period ended. 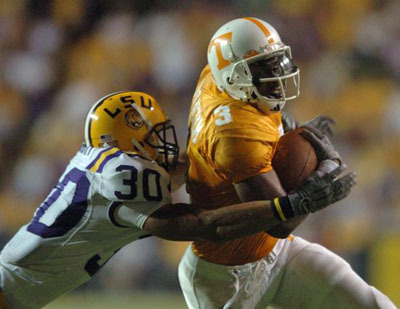 Gerald Riggs disappears under Chase Pittman. Davis outraces the Vols to the 2. On the ensuing kickoff, Justin Vincent blasted Arian Foster, causing a fumble. But UT recovered at the 23. The Vols overcame a holding penalty to gain a first down, but a second holding infraction caused a punt. Skyler Green fielded Britton Colquitt's punt on the 28 and returned 3y across midfield. L: Skyler Green escapes a tackler. DE Parys Haralson sacks Russell. The next possession started badly with an 8y sack. Two incompletions forced a Chris Jackson punt that Ronnie Prude downed on the 1. Hollis: It was a face coverage. I saw Cameron about to get that sack, and I was actually going up to hug him, and the ball just landed in my hands. L: Cameron Vaughn chases Ainge into EZ. R: Vaughn after throwing Ainge against the goal post. The devastating play proved fortuitous for the Vols. 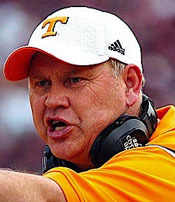 Fulmer might have changed QBs anyway, but, with Ainge injured, the coach sent out Rick Clausen. Because he had played at LSU, he wasn't intimidated by Tiger Stadium and immediately injected some life into the offense, completing several passes. 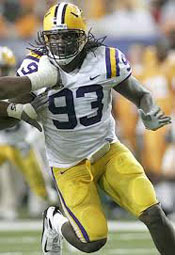 But after two first downs, LB Ali Highsmith's hit forced Riggs to fumble, and S Chevis Jackson recovered on the LSU 47. With a chance to practically put the game away before halftime, the Tigers benefitted from a personal foul penalty. 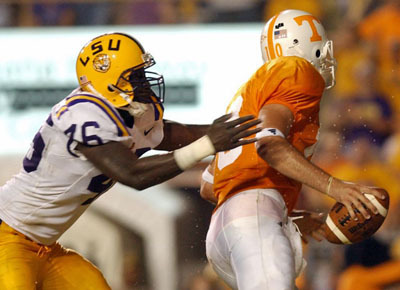 But Addai fumbled at the UT 28. With 3:22 to get on the board before the break, Tennessee went backwards when Chase Pittman sacked Clausen for a 13y loss. Rick dinked another short one for 4, after which LSU used a timeout. 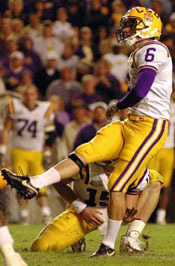 Colquitt boomed a 50-yarder to Green, who returned 16y to the LSU 42. The scoreboard clock showed 1:51 as Russell & Company took the field. Completions to Davis and Green brought one first down, then an 11y connection to Early Doucet gained another at the 36. 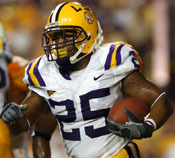 A costly completion of only 2 to Bowe forced LSU to use its last timeout at the 0:37 mark. JaMarcus then hit TE Keith Zinger who stepped out on the 13 - well within FG range. But after an incompletion, Russell did the last thing he should have. Taking the snap with 25 seconds left, he looked for an open receiver, then scrambled for 8y but couldn't get out of bounds. As the FG unit hurried to line up at the 5, the clock ran out. The Volunteers gained only 50y compared to 200 by LSU. In a Dickensian Tale of Two Halves, LSU would rue the loss of those three points before the evening was over. Q3: The Tigers made one first down on the initial possession thanks to an offside penalty but soon had to punt. 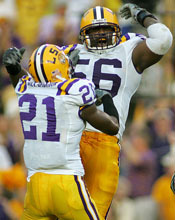 Green gave the Tigers good field position with a 27y return which, with 5y added for offense, put the ball on the LSU 41. But on 3rd-and-1, the defense stuffed Vincent for a 1y loss to force a punt. With Tiger defenders constantly coming off the field with cramps, the Vols moved from the 18 to the 46 before Tyson Jackson's sack ended the advance. LaRon Landry tackles Robert Meachem. The Tigers' next possession was their most disastrous of the game. On 3rd-and-8, Russell threw the ball straight to FS Jonathan Hefney at the 28. Only a body block by the 250-lb QB prevented the TD, Hefney sailing out of bounds at the 2. With Old Man Momentum wearing orange, the LSU offense lost 2y on three downs thanks to a false start penalty. Jackson banged a 49y punt which, with an illegal block penalty on the return, set up UT at their 37 with 5:24 remaining. After three plays gained only 3y, the Vols took over again on their 36 with only 23 ticks left, but Landry intercepted Clausen's heave at the Tiger 46. Russell again showed his inexperience by allowing himself to be sacked for a 10y loss. 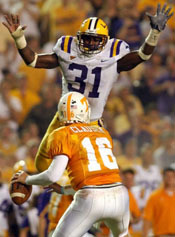 After LSU called its last timeout, JaMarcus launched a desperation pass in the direction of Doucet that had no chance as time expired. OT: Tennessee won the toss and chose to play defense. The Tigers, as usual, elected to move toward the student section in the North EZ. The second half numbers showed a complete turnaround from the first 30 minutes. UT amassed 205y to a mere 44y for the home team. Henry pushes through Vaughn for winning TD. Miles: We played well to a point. It was a sloppy first half. ... We came out in the second half and lost our push. ... You've got to give them some credit as well, and they played awfully well down the stretch. ... We played well in the kicking game. ... The thing that we are going to have to do is not dwell on this game. For all intents and purposes, it's Tuesday, and we'll prepare for Mississippi State. As much as we'd like to mull it over and recoach and get it fixed, we have to prepare to play the next game and get this team back and get them healthy. What contributed to the lack of offense in the second half? More than anything, I think it was a loss of poise. Russell finished 14-of-26 for 158y with one costly INT. We had some missed opportunities. We had tough situations where it was hard to get through. They played really good on defense. They played hard, and they played to win. Fulmer: I can't tell you how proud I am of this football team and this staff and the fight that they had. There was absolutely no panic at halftime. We talked about the heart, the toughness, representing the orange and white of Tennessee and taking charge of the football game. Obviously, the first five minutes were going to be really important. We got out there and got a stop. I don't know if there has ever been a better story than Rick Clausen. ... He is a tough-minded guy. He obviously had to handle the disappointment at the beginning of the week, and he handled it with toughness and class. His teammates rallied around him and obviously him coming in and getting done what he got done was just unbelievable. I am so thrilled with this win. I take my hat off to LSU, but our football team played really hard. We're a really well-conditioned football team. Physically it took us a while, but once we stopped shooting ourselves in the foot, we got it done. Clausen finished 21-of-32 for 196y. I'm so thankful for those guys in the locker room. It was a tough week for myself. I called home a few times. I didn't really want to be here. [My family] said you got to stay, you never know what might happen. ... I'm so thankful to ... the 70 guys in the locker room. Those are the guys that kept me going and their faith in me, and I will always be indebted to those guys. 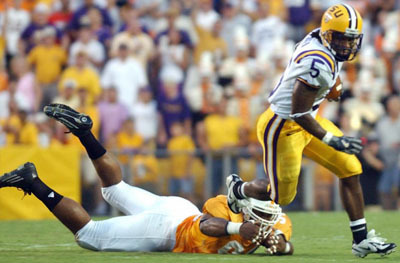 On returning to LSU: Death Valley is a great place to play. I've been here, and it's been pretty raucous. It was loud, and I enjoyed it. Rick's older brother Casey had played QB in the last game Tennessee had played in Tiger Stadium, a 38-31 OT loss five years earlier. Riggs: In the second quarter, our running game started picking up. ... Once we established that we were able to make some plays later on ... What was said at halftime? Nothing much. We've been down before. We have an experienced team. ... We knew what it was going to take. We just had to settle down and execute our plays.